Puffball mushrooms, Safty tips and Recipe. 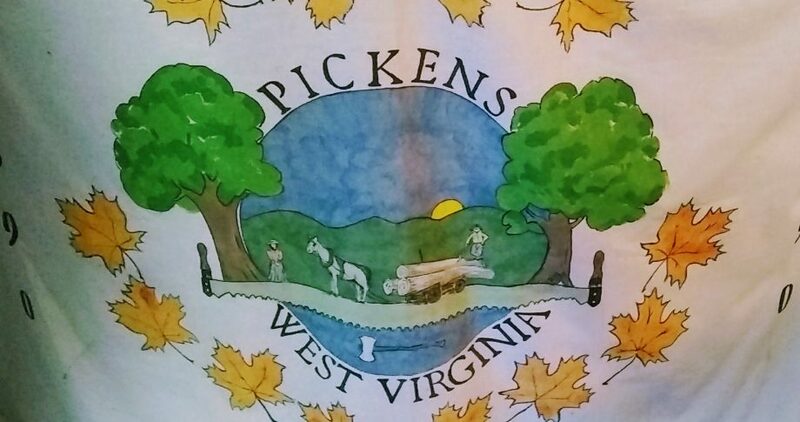 This time of year in West Virginia is a blend of late summer heat and cool rainy days. Perfect weather for wild mushrooms. This last week has been full of friends dropping by saying, ” While we were out in the ( you pick the place), woods, river bank or yard, we found this… mushroom. We were wondering if you can eat it ; do you know what this one is? Well most of our friends do know something about mushrooms so they do look for the edible ones but it is always nice to have some one back you up on what you have and if you should eat it. On Tues a friend dropped these two mushrooms off at the house he found them on the creek bank behind his house. Puffball mushrooms are very common and easy to find but to need cut in half when small to make sure they are not Earthballs or confused with a starting bud of the POISONOUS AGARIC mushroom. 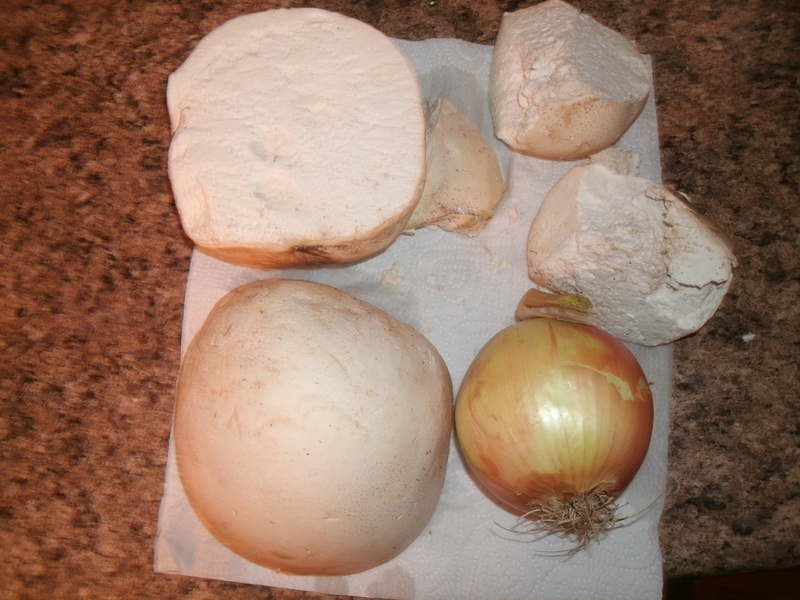 At this size a Puffball can not be confused with any other mushroom making it very safe to harvest. Earthballs are small round mushrooms that are a dark purple inside and smell very strong they are not for eating. The other poisonous agaric mushroom also forms into a white button when small and eventually forms a traditional ” toads stool” when mature. Slice open the ball and see if an egg-shaped cap appears inside the button,in some cases it looks like the soft outline of a mushroom growing inside the button. Do not eat the ones that have anything inside other than creamy white flesh.The inside of the Puffball is white and looks like cream cheese.It can be sliced and fried or chopped for other uses. Use them fresh and do not let the mushroom turn grainy or chunky that is a sign that the mushroom is deteriorating and spoiled. Always cook wild mushrooms some people are sensitive and could get an upset stomach when eating any mushroom cooking does help reduce the chance of an upset. 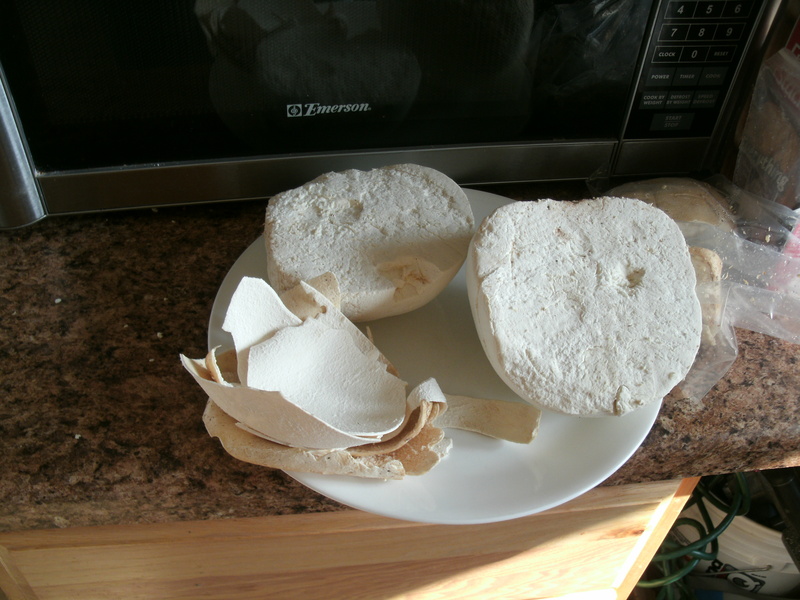 The frist step to cooking a Puffball is to remove the outside skin. This leaves you with the creamy white clean insides to eat. Again this was a 1 pound mushroom so with company on the way for dinner I thought an appetizer was in order and took half of the mushroom and chopped it fine and made a warm mushroom dip with garlic crackers. The dip left on the thin side has many uses like sauce for chicken or over noodles for a meatless mushroom meal. This is what the thickened dip looks like and it was a hit with company as I finished making the rest of dinner. 1. Saute mushrooms in a large frying pan on medium heat with 5 tablespoons butter and lemon juice until tender. 2. Add finely chopped onion. 3. Simmer 5 to 10 minutes. 4. Add sour cream, bouillon granules, and salt and pepper and simmer 3 minutes. 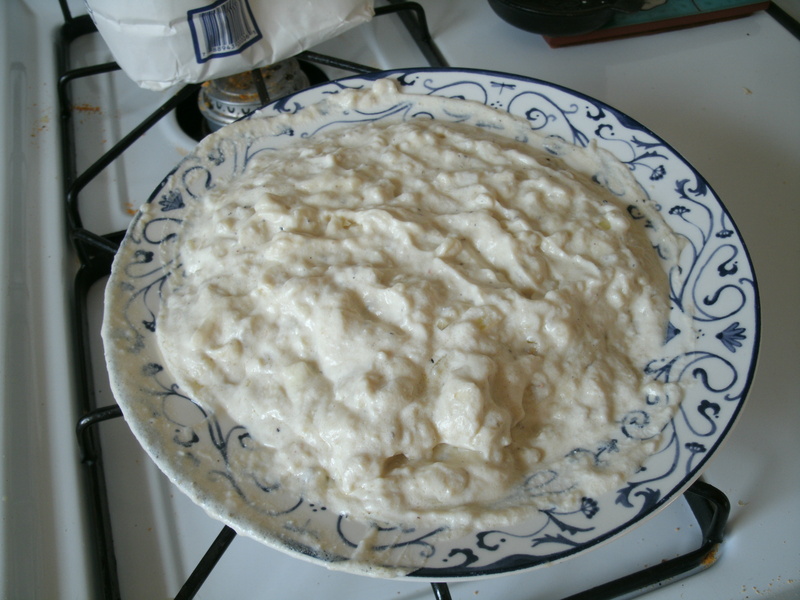 5. mix flour and two table spoons butter together into a paste use as a thickener for dip. 6. Add paste to hot sauce and stir until thickened. 7. serve warm in a fondue pot in small slow cooker for party’s. In my effort to learn more about mushrooms I have gained lots of safety tips and the above recipe from the wonderful book listed below. It is the book that we use the most. I think every beginner should have a copy the photos are wonderful and the information shared is simple and easy to use. I take it with us every time we are out in the woods. The book is easily found on Amazon at this link http://www.amazon.com/Wild-Edible-Mushrooms-Recipes-Mushroom/dp/0762771437/ref=sr_1_1?s=books&ie=UTF8&qid=1382016858&sr=1-1&keywords=Wild+Edible+Mushrooms. My son also bought me a second identification book for my birthday it is more of a traditional field guide with thousands of mushrooms and drawings. It is useful to give a second description for a new mushroom and is handy for ones that look so similar. It is recommend having at lest two books to use while trying to identify wild mushrooms. This book covers a larger verity of mushrooms and is handy when a question about what verity you are looking at or what ones are edible.Since we focus our time on the edible ones I use this book less often, but find it useful. Amazon lists several field guides, and regional guides to help with identification. 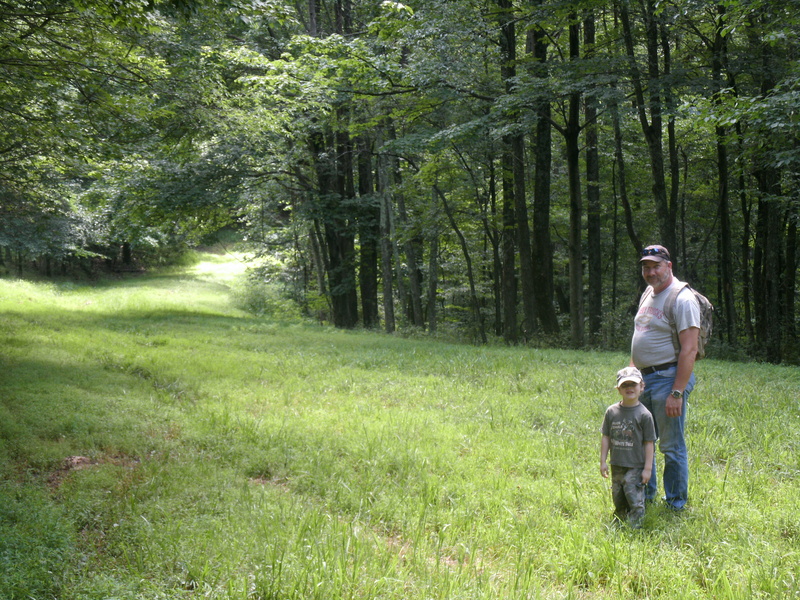 Mushroom hunting has been on of the best hobbies that our family enjoyed the last few years. 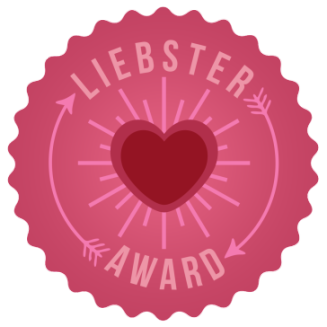 It is something everyone can do and share in from the littlest in our family to the oldest. The locations are not limited to the woods. As I explained the Puffball above was found in my husbands best friends back yard along a creek bank .So even a nice walk through a park or stream side maybe the place to find wonderful mushrooms to share. It is the time together walking, cooking and eating that makes this experience so much fun and healthy. It is nother way for me to eat healthier and be less dependant on society for my food. It is hard to believe but just one Puffball made about 3 quarts of meatless soup and a wonderful dip for entertaining all free for the taking. It is a lesson I am so glad I am learning. Tom and Christopher mushroom hunting in Jane Lew , W.V.